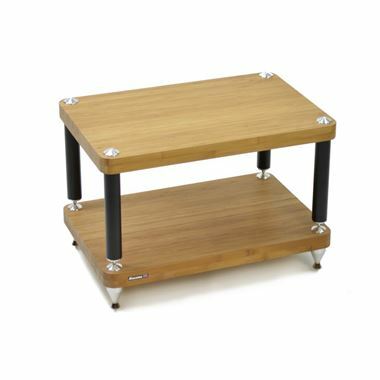 Atacama Evoque Eco 60-40 Special Edition HiFi Shelves - You can create your own table by adding 1x Base inc. Feet to your basket and then adding as many shelves as you require. The What Hifi? Sound and Vision magazine "2015 best equipment support" award winning Evoque Eco 60-40 Special Edition is a major technical step in Atacama hifi furniture design. Based on the "2014 best equipment support" award winning standard Evoque Eco 60-40, the Special Edition incorporates significant sonic and mechanical resonance control upgrades designed specifically for the hifi enthusiast who is looking for the ultimate in musical performance. This visually attractive and beautifully crafted British made modular support makes a stunning centerpiece and is perfect for both supporting and maximizing the performance of quality hifi equipment. Atacama’s high density carbonized bamboo gives significant major sonic advantages when compared to traditional hardwood and veneered supports, with its unique micro growth pore structure offering both excellent vibration absorbing and resonance controlling properties. The production processes, layering, density and overall thickness have been specifically chosen to give the best possible acoustic results. Atacama Sonic Isolation System Technology (A.S.I.S.T) has been incorporated into each module. This consists of two dampening gaskets* in each leg designed to reduce “ringing” and to isolate the Aluminium components from the outer leg collar. 3. Aluminium Top and Lower caps incorporating Leg Internal Suds. These components act as resonance conductors, allowing an escape route for this energy away from the bamboo shelves so that it can be dissipated through to the floor. Leg lengths are 15mm longer than standard Evoque, thus lowering the resonance frequency of each module* when compared to an equivalent standard Evoque. 5. NEW– Leg Tuning Counterweights*. By adding additional fully adjustable mass via Nickel plated Bronze frostrum cones to the leg internal studs*, the module frequency can be tuned to dial out the resonance of the specific equipment being supported. 6. NEW-V.R.D.C Vectored Resonance Deflection Channels. Each Bamboo panel has V.R.D.C Vectored Resonance Deflection Channels. V.R.D.C. is the three dimensional geometric design that has been crafted into the underside of each module. This complex pattern neutralises high frequency harmonic energy by directing it away from the supported equipment toward the leg grounding components. Each channel has been cut into a “V” shape so directing energy that is entering the shelf vertically into a horizontal axis so avoiding resonance feedback, maximising each modules performance. With so much resonance being directed away from the bamboo, the spike interface has now been opened so avoiding a constriction of this energy and allowing it to freely dissipate to the floor. *Due to the base modules requirement to release energy rather than control it, not all upgrades are incorporated fully into this module. Please note: - Bamboo is a natural material so colour, texture, grain and age may give a variable appearance to each shelf. Because of this, adding an extra shelf at a later date will introduce a batch /colour tonal difference. Where possible order your Evoque as a complete modular support with enough levels to fulfil possible future requirements in order to minimize this variation. There may be some darkening of the Bamboo over time. This is normal and part of the materials maturing process.